Moneta Musings: Lions, Tigers and Gold Bears ...OH My! Well the markets have been quite the rollercoaster over the past couple weeks. Of course stocks other than commodities and precious metals were rallying. Why were the stocks rallying? Well of course the rally is because a couple of anecdotal pieces of evidence came to light that indicate that the economy is less bad than expected. Now please dear reader, understand that I like just about every other American would like to see the US pull out of the current quagmire and move forward to happy days, but as a realist I want the move to be based in a long term reality. So a couple weeks ago the market decided that skies would be sunny for the rest of the century, peace would break out worldwide and prosperity was just around the corner. Needless to say the mood which was quite bearish reversed and suddenly we no longer needed any of the safety trade and risk has become the word of the day. Commodities got hit, gold got hit because one no longer needed these things. Besides the Chinese were raising rates so therefore they will have a hard landing says the collective common wisdom, which has been incorrect for as long as I can remember. Like many of you who read this column I have watched the precious metals sector give up gains made over the last year. Remember nothing and I mean nothing goes up in a straight line, for if it does it comes crashing down. So at the moment the precious metals are consolidating their gains. The catalysts for the next leg higher are slumbering at the moment but they will awaken at some point. Dear reader the catalysts include the Euro zone problems that are currently being just papered over, The US bond market that is just waiting for the “bond vigilantes” to show up, the covered up unsold inventory in housing, the collapse of cities and states, massive food inflation(notice the smaller containers in the supermarket maintaining price level), general inflation, and more unpredictable geo-political and or weather events(which will impact the agricultural, commodity and energy sectors). Mean while the media parrots the FED’s and Government’s statistics regarding unemployment and inflation and Joe Six Pack continues to pay the price. Poor Joe cannot understand how there is no inflation while it costs him more to take care of his family. Price inflation is rampant yet “B52 Ben” has the stones to go on 60 Minutes and boldly proclaim that he is not printing money and inflation is not a problem. I wish he could be forced to tell this lie in front of a panel of Joe Six Pack’s who are free to question him at length. I am sure that are some guys out there that would really like to put old Benny under the hot bright lights and yell at him Jack Nicholson style “that he can’t handle the truth!” At some point in the near future this disconnect will lead to some form of civil unrest. 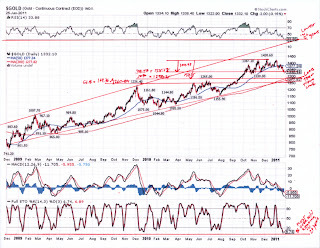 As I pen this missive awaiting the announcement from Benny and the Jets at 2:15 pm regarding their, oh so wise, decision on short term rates and the cryptic and myopic diatribe that follows otherwise know and the FOMC statement, gold has probed its 38.2% Fibonacci retracement at $1,325.69 twice and bounced off. For those of you who are unfamiliar the Fibonacci numbers were developed by Leonardo Fibonacci and it is simply a series of numbers that when you add the previous two numbers you come up with the next number in the sequence. Here is an example: 1, 2, 3, 5, 8, 13, 21, 34, 55. So when you add 1 and 2 you get 3? Now add 2 and 3 and you get 5, and so on. In the market many technicians and “technical funds” use these numbers to determine retracement levels. Since as I said before nothing goes straight up, market technicians have noticed over time that stocks tend to retrace at certain levels the most common of which are 38.2%, 50%, 61.8% and 100%. I have provided some charts at the bottom of this post for you to peruse after reading this post. So is the correction over in precious metals, the short answer to this is I don’t think so but it is much closer to resolution than it was even a couple days ago. The number of newsletter writers on the topic that are increasingly bearish is growing and I am seeing articles calling for $700 gold. So do I believe in $700 gold? Given the macro and geopolitical factors in play I find it hard to believe that we would go to $700 gold. Having said that I still maintain $1,280 - $1,260 or so is the potential bottom if $1,320 does not hold. It does appear that the market is stabilizing above the $1,320 area and that is a positive but the price needs to move above $1,340-5 with conviction to signal that the bottom is in and as long as the $1,325 holds the bears should be out of ammo for now. Much of this damage is in the paper markets and not the physical market as there are plenty of reports coming out regarding Asian and Indian buying at current levels as well as Central Banks like Russia’s and China’s announcing further buying. How did I arrive at these numbers? Based upon Fibonacci numbers I used gold’s high of $1,430.6 (intraday) and calculated the various retracement levels. So needless to say if we breach the 38.2% level with conviction a move in to the upper $1,200 range is in the cards. If for some reason the 50% level does not hold then we should get the final low somewhere between the 50% and 61.8% level. If these scenarios do occur the vast majority of traders and hot money will have vanished from the market and it would be the ideal place to put capital to work. Traders and the Johnny come lately crew will be mystified why gold rises again and they will once again not trust its rise until it has broken out to new highs. Once out to new highs the hot money will chase again driving yet another price rise. The key as a precious metals investor is patience and recognizing the “final top”, which is still quite a way off. 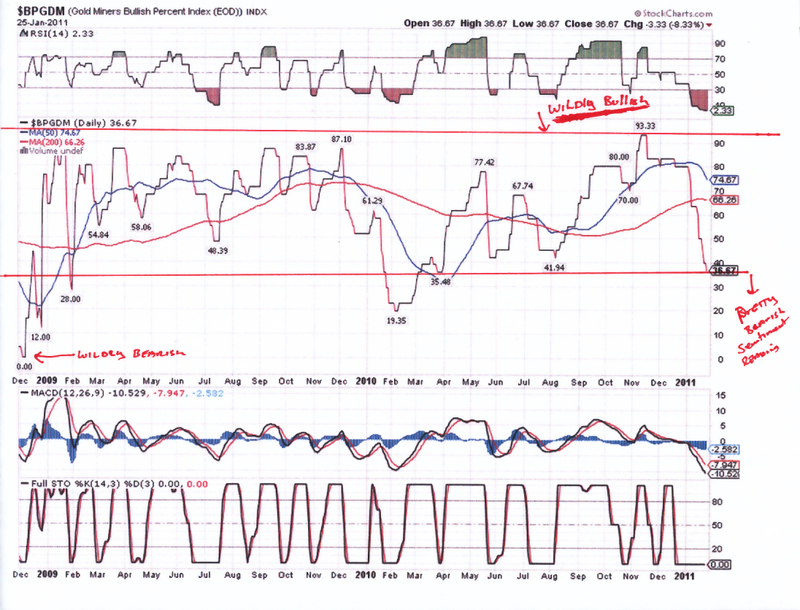 As for timing one of the items I use that has worked well in the past is the gold miners bullish percent index. 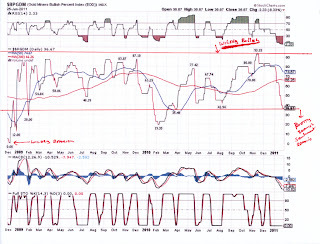 The “BPGDM” has moved in to low territory indicating to me a hard turn in sentiment toward the sector. While the BPGDM is not at the lowest level (excluding 2008 in which everything got slammed) as February 2010 provided us with a reading of 19.35 out of 100, the current reading is only 36.67% bulls. 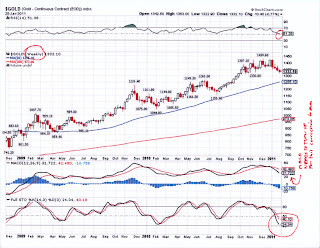 Clearly the BPGDM index has moved down sharply and is in the zone where bottoms are put in which is what leads me to believe that we are closer to a bottom than top in gold. 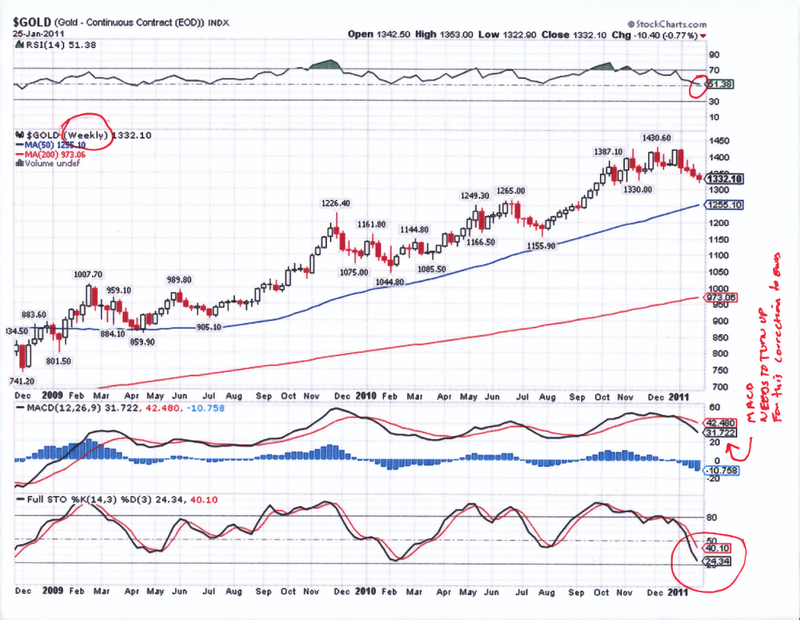 To me a coincident indicator for gold is the State of the Union (STOTU) speech last night which demonstrates why the end game is still far off for gold. I was watching the news talkies after the STOTU and one of the channels put together a montage of at least 15 prior STOTU addresses and it was amazing that the same exact message and many of the same phrases were used in all the speeches. This indicates to me that for all the high flying rhetoric from both sides essentially the can is being kicked down the road. There was lots of happy talk about cutting deficits yet there was equally as much talk about “investment” in education and green initiatives which is just code for spending. Moreover, there were no concrete items or definitive proposals yet there was lots of clapping and back slapping, none of which will fix anything. Additionally, such a big deal was made over the fact that members of both parties were sitting next to each other as opposed to being seated separately that it almost seems like a play. It was taken to a ridiculous level by the media like the whole country was hanging out waiting for the gossip of who was going to the prom with whom. The bottom line is what I saw was just more of the same cloaked in semantics, which leads me to keep on acquiring precious metals and their stocks. The other factor is the US Dollar which is not looking so great on the charts, but who knows what intervention will be used to levitate it. It looks to me as if it could be setting up for a run at the 75 level, which would not be good. Of course right now the Dollar is the best of the worst currencies, as someone said it is “the best looking horse in the glue factory”. 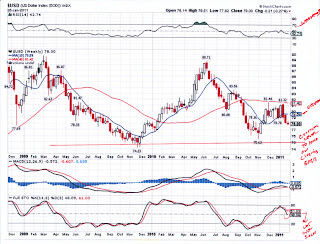 I believe that the chart is setting up for a potential break down maybe coinciding with a Chinese Yuan revaluation to alleviate their inflation problem. I have stated in earlier missives that inflation is stored around the world in pools like electricity is stored in capacitors, just waiting for a discharge. It is this phenomenon that I believe the “B52 Ben” does not get and the torrents of inflation that will be unleashed he will not be able to combat. Furthermore it could be the Yuan revaluation that will spark this and the anticipation of this is painting a negative dollar chart. 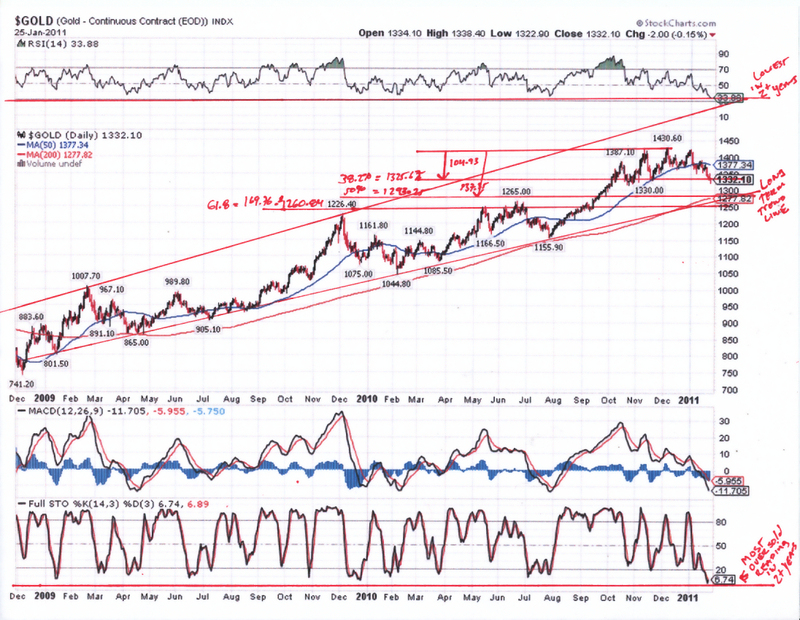 I truly believe that there is plenty to go in the precious metal bull and there appears to be a more than ample supply of catalysts and underlying fundamental reasons for it to continue. 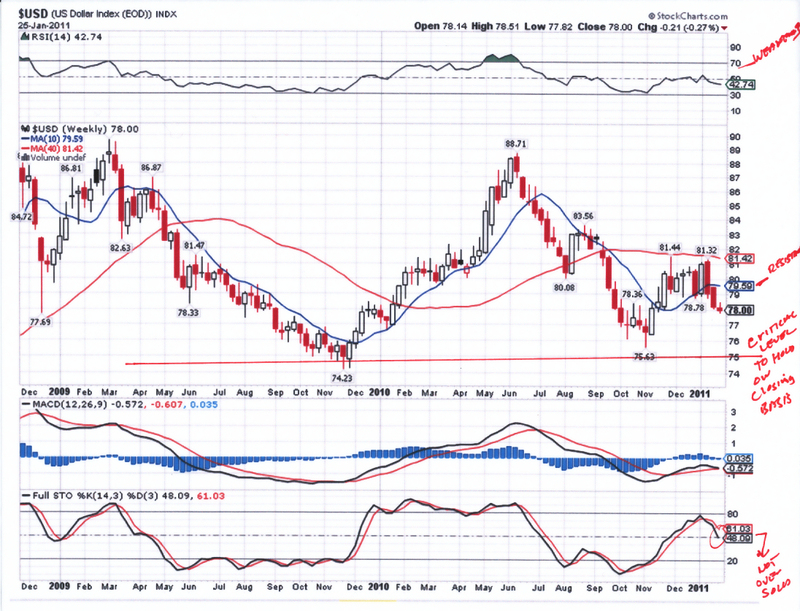 I would also contend that once this move down completes that the metals will grind higher to new ground. Time is the ally of precious metals in this case as it takes time to allow the papered over problems to unfold. I will be using any drop in to the $1,200 range as a buying opportunity par excellence. This chart puts the UGH in UGLY!